Abuja, Nigeria. June 5th, 2018 – Following confirmed reports that President Muhammadu Buhari has signed the “Not Too Young To Run” Bill into law on May 31st 2018, NOIPolls presents findings from a past poll conducted in partnership with Business Day Media in June 2017 which highlighted the perceptions of Nigerians on age preference in the 2019 Presidential election. The “Not Too Young To Run” Bill sought to alter some sections of the 1999 Constitution of the Federal Republic of Nigeria (as amended), reducing the age qualification for the office of the President from 40 years to 35 years and other public offices such as the office of the Governor, the Senate and House of Representative. The results revealed that almost half of those interviewed (48 percent) expressed their preference for middle-aged presidential candidates as 64 percent of Nigerians disclosed that they would prefer to vote for a presidential candidate between the ages of 40 and 50 years in the 2019 Presidential election. Reacting to this, the CEO NOIPolls, Dr. Bell Ihua, commended the President for signing the bill into law, stating that it is a positive move in strengthening the country’s nascent democracy and further encouraged those in authority to continue to listen to the voice of the people. Interestingly, respondents aged between 18 to 35 years had the larger share of Nigerians (49 percent) who would prefer a middle-aged presidential candidate, while respondents aged between 18 – 35 years accounted for the largest proportion (37 percent) who wanted young people to run. Those aged 60 years and above (24 percent) preferred an elderly presidential candidate. Perceptions on maximum age preferred for presidential candidates for the 2019 election revealed that majority of the respondents (64 percent) stated that they preferred candidates between the ages of 40 and 50 years, categorized as middle-age. Despite the huge support for middle-aged presidential candidates in 2019 election, most Nigerians disclosed that financial constraints (40 percent) would prevent young professionals from vying for elective public offices such as governorship and presidential positions. In conclusion, the passing of the “Not Too Young To Run” into law is in line with the demands of the people as our results have clearly revealed that most Nigerians prefer young (35 percent) to middle-aged (48 percent) presidential candidates in the 2019 presidential elections. It is pertinent for political parties in the country to adjust their constitutions and guidelines to ensure youth inclusiveness and candidate age selection limits. 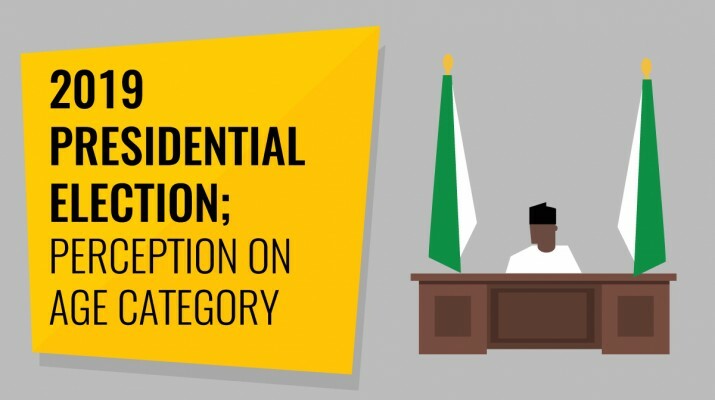 Finally, most Nigerians identified financial constraints as the main factor that could prevent young professional from vying for elective positions in 2019 election, highlighting the need for political parties to ensure that costs of nomination forms are reviewed downwards for all positions to ensure massive incursion of young people into the political terrain from 2019 onwards.